I’ve always had a wonderful relationship with my son. I love my son and discipline him appropriately and fairly. Sometimes it’s hard for me to remember that not every child has been treated with the utmost love and respect by the one responsible for bringing him up. Well, I met a man one day who indeed hadn’t had the loving father he needed. This is his story. But first, I must tell you how this particular day began before I met this boy named Johnny Clover. You see, I had sent Mark outside to get started for school. But when I came out a bit later, I saw Mark leaning against Blue Boy and daydreaming. I hade to call his name a couple times before he suddenly snapped to attention. I shook my head as I walked over to him. It didn’t take me long to figure out what he was daydreaming about. “Pa, I was noticing the barn. It sure could use a cleaning,” Mark commented. I couldn’t argue with him there! “Well, it sure could!” I agreed. “Now, tell me something. How come you never notice things like that on a Saturday?” I knew exactly where his little brain was going with this. His excuses never worked! I don’t know why he kept trying. “Well, I just happened to notice it now. And I could clean it up good while you’re in town,” he smiled so innocently at me. “School?” Mark knew he had been figured out. But he tried to ask the question innocently. “School,” I repeated, making my question clear. “Oh, well…” I could tell Mark’s brain was working hard to come up with an answer. “Oh, well…Miss. Adams says I’m doing good, and missing one day wouldn’t hurt…much?” The much was said with a lot of hope. After Mark got up onto his horse, he still wasn’t too thrilled about going to school and he didn’t even try to hurry his horse up, so I bent over and gave Blue Boy a hard smack to get him going. We rode in together, father and son side by side. What a peaceful scene that would be for any passers-by. This would be one of the things that remained etched out in my memory for many years to come. I rode with Mark all the way to the schoolhouse. I watched Mark climb down from his horse and tie him up. Then I rode off. I hadn’t gotten too far when I suddenly heard my son yelling for me to come back. "Pa, Pa, come quick!" At the sound of my boy’s voice, I quickly raced back, fearing there was some trouble. "Pa come on," Mark yelled impatiently. When I was back in the schoolyard, I jumped off and grabbed my rifle just in case I would need it. "What's the matter son?" I asked. "It's Miss Adams," said Mark. I rushed into the classroom and started toward her desk at the front, but Mark grabbed me by the arm and stopped me. Then he guided me to where she was laying on the floor, unconscious! I quickly laid my rifle on a desk and bent down to see what I could do. I told Mark to go get me some water. I started wiping her face, hoping the doctor wouldn’t be needed. Mark sta rted walking around the classroom, surveying the damage. Desks were overturned, books torn apart, and papers were stern all over the place. "Boy, somebody doesn't like school," Mark remarked. 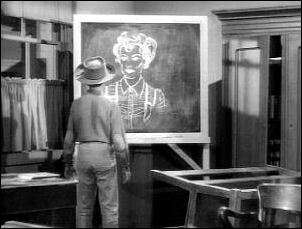 Then Mark noticed a drawing on the blackboard. I heard him quietly mutter, "Johnny Clover." "Nothing Pa," Mark said quickly. He didn’t want me to get Johnny into trouble. "You mean Johnny Clover did this?" I asked, expecting him to answer. But Mark was remaining loyal to Johnny. He knew I had heard him. "I don't mean nothing," he insisted. I could tell by the look on her face that it was. "What ever gave you that idea," she asked a bit surprised. Mark admitted that he gave the name away. "Me, Miss Adams, I saw the picture. There isn't anyone else who can draw like that," Mark explained. Being on the town council, I knew I’d have to take some sort of action. But first I wanted to see what the damage was, so naturally, I wondered if anything was stolen. Miss. Adams insisted Johnny wasn’t a thief, but I insisted that she look anyway. While she was doing this, I pulled Mark aside to find out exactly who this Clover kid was. I wasn’t sure if I knew him or not. “Yeah. He’s the boy who’s pa was killed in the stampede at last year’s round up,” Mark answered. I did remember him. His uncle had come out to take care of him and the ranch. I was surprised Johnny was in school since he must have been at least 18 years old! “He sure did look funny in class!” my boy commented. Miss Adams heard this and she let Mark and I know what she thought about that statement. “You children made that very plain to him, Mark.” I must say I agreed with her that Mark’s comment and actions weren’t pleasing. Miss. Adams reported that Johnny had only taken paper and crayons. I wanted to go see Micah about pressing charges, but Miss Adams didn't want any trouble for the boy. She was hoping that Johnny would come back to school or maybe go off to a better one. He has a wonderful mind and a wonderful talent, as she put it. I told her that was her choice. But since I was part of the School Board, I had to tell her that we would want someone to pay for the damages. I told her I would go out and speak to the boy’s uncle and see if he would be willing to pay for the damage. Well, it was quite a task to get to his ranch. I had to go over a creek and through the woods to get there. I didn’t get the feeling Mr. Fremont was all that happy to see me either. I asked to see Johnny and he demanded that I tell him why I wanted to see him. I told him I wanted to talk to Johnny about school, and he proceeded to inform me that he knew Johnny wasn’t going. He didn’t care if the boy went if he wanted to, but with his age, he was getting a little too old to go to school. “He can read and write and figure, and I guess he reckons that’s all a man needs to know to feed himself. Can’t say I blame him. Oh, not that I don’t hold to education. I do. But, a man can have too much of it. She had him wasting good working time drawing pretty pictures. Now, that’s nothing for a boy near a man to be doing. I reckon that’s why he stopped going to school,” Mr. Freemont tried explaining. But I was here to inform him that he had been to school. I told him what he had done to the school. “Smashed everything up: desks, chairs, tore up school books.” I told him it was going to cost quite a bit to repair all the damage. Mr. Freemont seemed surprised that I was asking him to pay for it. I kindly reminded him that Johnny was his nephew, and that made him responsible. 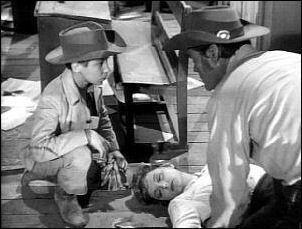 Fremont was reluctant to pay for any damages and said he would think on how to pay for what the boy had done. Money was not a crop around their ranch. I started to leave, but stopped to tell him something else.. “Oh, and you can tell your nephew that in spite of what he’s done, Miss. Adams still wants him to come back to school.” As I rode away, I thought the visit had gone well and believed that Freemont would assist us as much as possible. Little did I know what kind of man this Freemont really was. He had no love for the boy. While we were talking, Johnny had been sitting in the barn drawing a picture. As Freemont watched me ride away, he muttered, “Co-operative.” Then he picked up a strap from the porch and went to find Johnny. Well, he found the boy all right. And he immediately let Johnny know what he though t of him. “So you was at the school,” Freemont stated to Johnny. “At the school?” Johnny questioned as he continued on his drawing. “I told you I didn’t want you wasting no time on that drawing!” he suddenly yelled at Johnny. He grabbed the pad out of Johnny’s hand and threw it on the ground. Freemont stated that no kin was going to be any better then him. He didn’t want Johnny to be fancy talking and looking down on him. “But you got no cause to bring trouble upon this house. Strangers demanding money for your stinking tricks. Well, I’m going to take it out of your hide in advance!” Freemont sneered at Johnny. Johnny screamed at Freemont, telling him he wasn’t going to “log” him, but Freemont grabbed him and threw him down on the ground. Then he raised the strap to beat him. When I got back to town, I picked Mark up and we went to talk to Toomey about the price for repairs. Toomey was telling us what he was going to have to do to fix the school benches. I wanted to know how much it was going to cost me, and reminded him that it was the school board’s money, not mine. “I’ll charge you for the materials and throw the labor in free,” Toomey announced. I didn’t figure I could ask for more then that. But Mark, my good little boy, spoke up with his opinion. “He could throw in the materials, pa,” he stated. Mark was happy about this, but my boy was on a roll and he wasn’t about to stop yet! “And will you buy a ticket to the covered dish picnic?” I couldn’t believe this boy! Suddenly, we heard gunshots coming from the saloon. I rushed out to see what was going on, and naturally Mark and Toomey rushed out after me. Come to find out, it was Johnny Clover! "Johnny Clover's drunk and he's shooting up the saloon." Micah and I walked in to see Johnny trying to get Sweeny to give him a bottle. 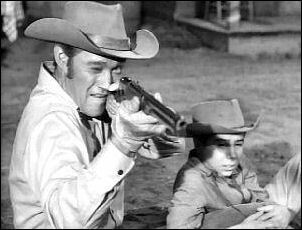 Micah told Johnny to put the gun away, but Johnny was very drunk and being very uncooperative. I told Johnny he better do like Micah said, but he said he didn’t have to put the gun away. Micah looked at Sweeny then. “You don’t know when to stop selling liquor, do you?” he accused. 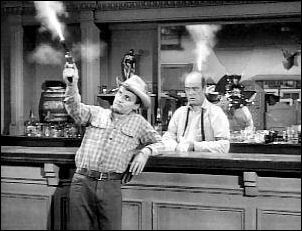 But Sweeny insisted that Johnny was drunk when he came into the saloon. Johnny went off again telling us that he wanted some more to drink. I again ordered him to put the gun away. “You don’t want anymore trouble then you’ve already got, do you?” I asked him. At this point, all I cared about was getting that gun away from Johnny. A young, inexperienced drunk with a gun made me really nervous! Micah informed him the celebration was over. Again, I asked him to put the gun away. He was getting more upset, and I was really nervous about what he would do with that gun. He demanded me to put mine away. Because I was afraid of what he might do with that gun, I put it away, hoping that would convince him to put his down as well. It didn’t work though. I put my rifle on the counter and reached out for his gun, but he pulled away. He asked me if I was going to wallop him. “No, I’m not going to wallop you,” I assured him. Sudd enly, my head spun around. Mark knew better then coming in here in the first place! I was already angry with Johnny, and the thought of my son being included in this trouble made me even more angry! “Stay out of here, Mark!” I demanded. Mark started to obey me, but then Johnny demanded him to stay there. Then he changed his mind and demanded Mark to come over to him. Again, I told him to stay out. But Johnny trumped me when he told Mark he’d shoot me if he didn’t come in. This got to Mark. He felt he had no choice. Mark slowly walked forward. "If you hurt him…" I started. It was one thing that he was threatening me with a gun. This was a whole other matter and it made me mad! Mark was nervous about this situation too. He didn’t know what to think about all this! So he quietly asked him what the question was. It wasn’t exactly a question, though. It was more like an accusation. "Now he wallops hard, don't he," asked Johnny? Now, I’ve always taught Mark to tell the truth. He did without hesitation. "My Pa never wallops me," Mark stated. This wasn’t exactly the news Johnny wanted to hear. He was surprised, to say the least, that not all kids were treated with the harshness he had always been treated with. "Alright Johnny, you got your question answered, now put the gun away," Micah stated. But Johnny wasn’t satisfied. He was upset that he had been treated so cruelly his whole life while Mark was disciplined in a loving, nurturing way. "But that ain't fair!” Johnny cried, feeling defeated. “I've been walloped almost everyday of my life. You mean to tell me he never smacked you," Johnny asked, almost hoping Mark would tell him something differently. I didn’t want my son in any more danger then he was already in. For this reason, I told Mark to keep quiet. "Johnny, listen to me," Micah started. But Johnny didn’t give him a chance to talk. "Shut up! You gotta lick kids! That’s what my Uncle Gus says. That's the only way to raise a kid. Now you lick him good!" Johnny was so upset – too upset. I knew he could very easily pull that trigger. My son was there with us, and I didn’t want to take any chances. Micah was getting desperate and started to say something to me, but I stopped him. I slowly started taking off my belt. I had a plan on how to end this thing, but I had to be very careful not to spook Johnny. Johnny asked me what I was doing. “Got to have something to wallop him with, don’t I?” I slowly removed my belt and held it in my hand. Then I told Mark to come here. He stayed where he was, but Johnny looked away to see what Mark would do. Mark took a step forward. I used that distracting moment to hit the gun out of Johnny’s hand with my belt. Johnny bent down to pick his gun up and I slapped him across the face with my belt. He fell to the floor. I took him to Micah’s office to sober him up. Then we had a talk. "You do wallop hard Mr. McCain," Johnny stated. I had only done what I had to do. "Well it was no more then you deserved boy.” I pointed this out. I know he had gotten more beatings then he ever deserved, and that’s what made him act like that. Now that Johnny was sobering up, he was more agreeable with me. "Your right sir. I don't know what came over me. I've been doin' some pretty wild things" Johnny’s voice held genuine regret. "What do you have against the school?" Micah suddenly asked. It was time to get down to the heart of the matter. Johnny stated he did enjoy going to school and still wants to go, but Micah pointed out that he had a poor way of showing it. “I don’t know what got into me. I was going by the school. All I meant to do was to go in and get some paper and crayons. Well, I didn’t want to talk to her. Well, she’s always talking to me about how I should really be going to school. How I should maybe go away and study drawing pictures. Well, I couldn’t stand to hear that.” I felt sorry for him. I knew he had it rough, but like Micah said, he did a lot more then just take paper and crayons. Johnny knew he had done wrong. But now we had to discuss his paying for the damage. Micah asked him if his uncle would pay for the damage. This set Johnny off again. It was obvious that Johnny was scared of his uncle. He didn’t want to go back there. “I’ll get a job. I’ll pay you back somehow,” he promised. Mark had sat quietly the whole entire time we were there. But suddenly, she stood up and walked over to me. My head quickly shot over to him when he walked up right beside me and stated, “You could give him a job, pa! There’s a lot of work to be done around our barn.” I couldn’t help but give him a dirty look. First of all, he opened up a big can of worms by saying that; and second of all, I couldn’t help but to think my son was trying to get out of cleaning the barn! I couldn’t stand this! I wanted to say no, but I had Johnny begging me on one side, and Mark begging me from the other. How could I say no to that? With a lot of hesitation in my voice, I finally said yes. Micah suddenly jumped in and reminded me that Freemont was an ornery man, and he wouldn’t like my helping the boy. “Well Micah, I feel like I’m helping myself by hiring a hand,” I said this while looking at my son who was grinning from ear to ear. He had really pulled a fast one this time. I shook my head at him. I’m sure he was happy he wouldn’t have to clean the barn! Mark stood and looked at me. I snapped my fingers and pointed at him. “You too!” Then I laughed as I thought about what a sneak that boy of mine was! Freemont showed up in town shortly after we left looking for his Nephew. Micah told him where Johnny was, and Freemont was none too happy about it. He was very angry when he rode off, promising he would not forget about this. Micah knew there would be trouble. That next Saturday, we were having one heck of a good time at my ranch. While the cows grazed on the range nearby, the kids and adults were having fun playing all sorts of games. There was a tug of war game going on, and one boy was standing by the bridge over the creek looking into the water. Everyone was having a grand old time! With all this food around, I was getting hungry. So, I tried to grab a bite to eat. One of the ladies standing at the table smacked my hand! I took that as a no to food – and on my own ranch too! So I walked away from the food and went to see how Miss. Adams was doing with the money raising. So far, we had raised $47.50. That was more then enough! We would have books to spare with that much money! Miss Adams asked me if we were going the square dancing before or after the food, and I stated after. “Men feel they need their strength. It’s been such a long time since the women of North Fork have had an excuse for dancing!” I declared. Johnny was working hard that day. He was drawing pictures to sell to the party guests. The money he earned went towards the damages to the school. Johnny really wanted to be able to pay for the school books himself. The way his pictures were selling, it sure looked that he would. Even Toomey wanted a picture of himself. I couldn’t help but to tease Toomey. “Got your work cut out for you now, Johnny!” I teased. Toomey laughed. “He has that, Lucas. I had one of the photographers take a picture of me once, and id didn’t turn out much good somehow,” Toomey stated. Again, I had to needle him. “What’s the matter, Toomey? Look too much like you?” We all laughed about that. Just then, a very excited Mark came running up to me and told me the three-legged race was starting. I had promised to participate in it with him. So without further delay, I went to keep my promise. Little did I know that Freemont was coming to the ranch. But he wasn’t coming to have fun – he was coming to inflict more of his barbaric discipline on his nephew. The gunshot was fired and Mark and I were racing in the race. Freemont watched the festivities from a distance. 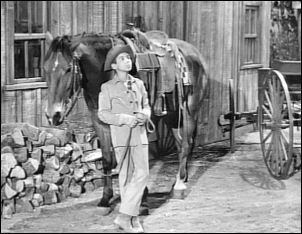 Johnny and Toomey sat in the corral as Johnny drew his portrait. Freemont watched from a distance. Mark and I were having a blast spending quality time together. We had no idea that Freemont was about to trespass uninvited onto my ranch and inflict terror in his nephew! Toomey was getting tired of posing and started to ask Johnny how long it would take. Suddenly, he gasped. “Freemont!” he shouted. Johnny turned and saw him approaching, whip in hand. Freemont climbed over my fence and stood just feet in front of Johnny. “You and me got a lot to settle,” he informed Johnny. Toomey tried to stop him, but Freemont told him to stay out of it. “You aren’t going to do anything!” Johnny stated. I had no idea Freemont was there. Mark and I were still enjoying ourselves. We weren’t doing very well, and I laughed as we fell again. Mark started to stand up when suddenly he saw the commotion in the corral. I looked up and saw it too. “Freemont!” I shouted. But Freemont tried to tell me it was family business, and that he would kill me if I didn’t stay away. I wasn’t going to stand by and let him enforce more so-called “discipline” on that boy! Besides, he was on my property! Mark and I were still tied together, so I told him to come on. As we raced across the bridge, we fell again. I finally picked Mark up and ran as best I could. Freemont was whipping on Johnny, and had already pushed Toomey out of the way. He had to be stopped and now! I raced for my horse and grabbed the riffle from the boot. Then I raced to the corral. 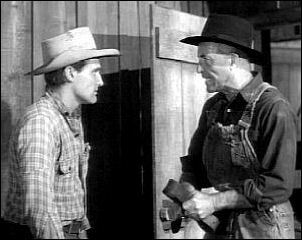 “I got a better way than whipping you, boy,” Freemont was saying to Johnny. “I’m going to put a bullet through your drawing hand. Stick it out!” He demanded. But Johnny stood still. Freemont finally upped the thereat. “Stick it out or I’ll shoot it where it is!” he insisted. With that he cocked the hammer on the pistol. Johnny was terrified. He had no choice, so he slowly began lifting up his hand. I landed in the dirt right outside the corral. Then I lifted my rifle, aimed, and fired, shooting Freemont in the shoulder. I was so grieved that it had to end this way. An uncle who should have been loving his nephew and teaching him how to be a good strong man had to be shot by a stranger because he hated his nephew. I was sorry my boy had to see any of this! The frustration of the situation showed on my face as I began untying the rope around my and Mark’s ankles. A few days later, Johnny was getting ready to leave. Miss Adams was taking to meet the stage. Johnny was nervous about going east to school. He had sold the ranch after his uncle left. But we all knew this was the best thing for him. We also knew we’d probably never see him again. But he would be happy. Mark and I said goodbye to Johnny, wishing him good luck. Johnny left us with something we could remember him by. It was a picture of Mark and I. He said it didn't exactly look like us, but it was the way we appeared to him. I had the rifle in my hands, and Mark was leaning against me. I thought the picture summed us up pretty well. What do you think? piddlin'stuff.....Three legged Terror ~ William Conrad our own Jake and the Fat Man ~ Cannon ~ directed this episode. Dennis Hopper appeared in two episodes ― The Sharpshooter as Vernon Tippert, he was the young sharpshooter — The Three-Legged Terror as Johnny Clover, a teenager who vandalizes the classroom in the North Fork School. John Hoyt appeared in two episodes ― Three Legged Terror as Fremont, Johnny's uncle ― The Martinet as Capt. Josiah Perry, the former army captain who came to North Fork to kill the man who shot down his son in a gunfight - Lucas McCain. Patricia Barry appeared in three episodes ― A Time for Singing as Laurie Hadley, she was the wife of Spence, the leader of a gang who were going to rob the North Fork Bank, she 'supposedly' was the preacher's wife. In The Woman ― The Three Legged Terror as Adele Adams, North Fork's school teacher. Martha Smith as on of the ladies at the picnic. She is the lady that scolds Lucas for trying to sneak a bite ahead of time at the buffet table. Larry Asmus played one of the kids that went to the town picnic out at the McCain Ranch. He was the boy with the checkered shirt. Jimmie Booth was in five episodes ― Shivaree as a Barfly ― The Indian as one of the townsmen ― The Challenge as as one of the townsmen ― The Three Legged Terror as one of the cowboys at the picnic ― The Coward as the cowboy sitting at a table in the restaurant of the hotel. *North Fork had three different school teachers.....Marilee Phelps - played the school teacher, in Eight Hours to Die. (1958) Depending on where you check this info you will find her credited as Miss Adams or teacher. Although we never saw Miss Pritchard, she is mentioned in The Jealous Man. So I guess you could say 4 different teachers, but we only met 3 of them.